These fungi belong to a group of large and fleshy fungi called Clavariaceae. They include simple, unbranched, upright clubs and fleshy, intricately branched coral-like forms. Sometimes create dense, complex, branching clumps of growth which resemble corals, or cauliflowers. 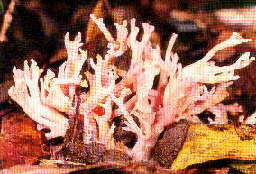 Coral fungi are saprobes with both terrestrial and lignicolous forms. They produce erect basidiocarps that may be simple and reasonably club-shaped or branched. Collectively, they are known as coral fungi as the basidiocarps of some species are branched to resemble coral. The fruiting bodies are generally not differentiated into an upper sterile surface and fertile underside, but instead, the spore-bearing basidia line the smooth to sometimes wrinkled surfaces of the upright clubs or branches. They normally have a sterile base, stalk or trunk though. Spores are produced on most of the surface, apart from the stem. Coral fungi are conspicuous and colourful, and some of the larger forms are edible, but others are very distasteful. From a taxonomic standpoint they are difficult, and in the past, all coral fungi were sorted together in only one genus (Clavaria). Now there are more than 30 genera recognised, largely based on microscopic and chemical characteristics. The biggest and most common group is called Ramaria. Most coral fungi are found growing in soil rather than on decaying wood. They are mainly found in moist regions as they can sometimes dry out easily. They usually produce thin upright fruiting bodies, and are often quite colourful. Some of these may grow in colonies that suggest coral formations.